Druckerman’s Bringing Up Bebe made a splash last winter before it had even hit the shelves at bookstores. 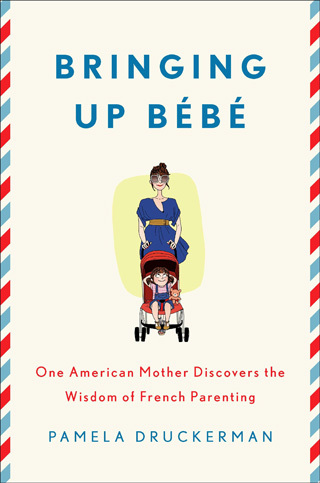 The book stirred up controversy by promising to show American mothers just how much better French mothers do it. The book wasn’t as anti-American as it was portrayed, but it was still a very entertaining read. Druckerman’s PR folks decided to pull out all the stops by casting their lot in with Amy Chua of Tiger Mother fame. Chua’s advanced praise received the top spot on the back cover. (Spot two went to French Women Don’t Get Fat author Mireille Guiliano.) If the two of them combined isn’t enough, Chua “couldn’t put Bringing up Bebe down” and “love[s] Pamela Druckerman’s premise that parents of all cultures should be able to learn from one another.” While true, it’s laughable coming from someone whose notoriety is based on her disdain for Western mothers. This book wasn’t a how to to French parenting but a memoir of Druckerman’s struggle to be a good mom and fit in with the French mothers who surrounded her. Unsurprisingly, French babies are better eaters and sleepers than American babies. Dr. Michel Cohen, author of the New Basics and a French doctor transplanted in Tribeca, recommends that parents pause before responding to their crying newborns. He says this gives the infant a chance to self soothe and sets them up for successful sleep. In The Happiest Toddler on the Block, Dr. Harvey Karp makes the same recommendation to teach toddlers patience. As far as eating is concerned, French infants eat four times a day by two to three months old. This schedule encourages good eating habits. As they age, French children are introduced to a world of wonderful foods, which they eat and enjoy. French mothers know they have to keep trying to get their kids to eat new foods. French women spend 89% more time doing household work and caring for their children than men do. According to Druckerman, an indication of rampant sexism in France is that post partum perineal retraining is often used to keep French husbands satisfied, not to help women. I do think the government benefits parents receive might help French mothers feel better about the discrepanices. In the end, I can conclude that Chua was right, using tips from other cultures can be good for us as parents. I think that does neeed to go both ways; Western mothers aren’t all overindulgent and sometimes we do say no to our children. Do you have any thoughts on this book? This entry was posted in books, culture and tagged 3 stars, book reviews, memoir, nonfiction, Pamela Druckerman, parenting, parenting books, the modern woman. Bookmark the permalink.